Mike Moustakas scored on a wild pitch in the sixth inning as the Milwaukee Brewers beat the Chicago Cubs 3-2 in Chicago on Monday night. Jonathan Schoop and Orlando Arcia also drove in runs for the Brewers, who climbed to within one-game of Chicago for the Central Division lead. The Brewers have now won four straight games and 10 of their last 12, while the Cubs have dropped three straight. After a slow start for Cubs starter Jon Lester, he was in control, retiring the first two hitters in the sixth inning. But that’s when Lester started to suffer lower back stiffness, allowing a single to Moustakas and a double to Erik Kratz. The Cubs went to Carl Edwards Jr., who uncorked a wild pitch on the very first pitch, allowing Moustakas to score what turned out to be the game winning run. Josh Hader took over for the Brewers in the seventh inning and struck out all six batters he faced. Jeremy Jeffress came on to save it for the Brewers in the ninth. The Brewers and Cubs play game two of their series at Wrigley Field tonight. Jhoulys Chacin (14-6, 3.59) goes for the Brewers. Jose Quintana (12-9, 4.14) gets the nod for the Cubs. Corey Knebel helped off the field in the 9th after injuring his left hamstring. Jon Lester pitched six innings of shutout ball, leading the Chicago Cubs to a 8-0 win over the Milwaukee Brewers in the first of a four game series at Miller Park on Thursday night. Lester struggled in the season opener against Miami, making it through just 3 1/3 innings, but he made up for it on Thursday night. The Brewers managed just four hits for the game, three off the bat of reserve infielder Jesus Aguilar. But the Brewers didn’t just lose the game. 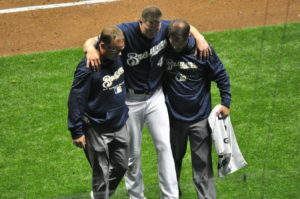 They lost their all-star closer Corey Knebel after he collapsed on the mound in the 9th inning with a left hamstring injury. Manager Craig Counsell said Knebel will undergo an MRI and will spend some time on the disabled list. How much time is yet to be determined. 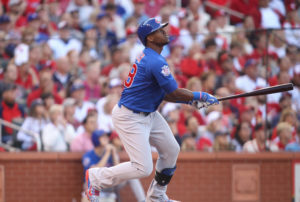 The Chicago Cubs scored five runs in the first inning and went on to knock off the Milwaukee Brewers 6-1 at Wrigley Field on Wednesday night. Jorge Soler’s three-run home run was the big blow off of Brewers starter Jimmy Nelson, who wound up losing his sixth straight game, falling to 6-13 on the season. David Ross would lead to the Cubs lead in the third inning, clubbing a solo home run to give Chicago at 6-0 lead. The Brewers only run came in the sixth inning when rookie Orlando Arcia’s infield ground out scored Keon Broxton from third base. Jon Lester earned the victory for the Cubs, retiring 10 straight hitters from the second until the sixth innings. The Cubs have now outscored the Brewers 14-1 in the first three games of the series. It’s Chicago’s fourth straight win over the Brewers and it’s their fifth straight win in Chicago. The Cubs shoot for the sweep this afternoon when they send Jake Arrieta (14-5, 2.55 ERA) to the mound against Zach Davies (9-5, 3.80 ERA).